Birds of a feather flock together, especially when there are some particularly tasty crumbs to be had. 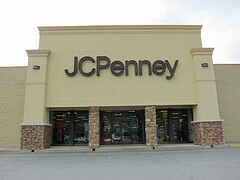 In thise case JCPenney is joining Macy’s in opening at 8 p.m. on Thanksgiving Day, the better to gobble up whichever tasty customers are tempted to start shopping as early as possible. JCPenney needs this holiday boost to bolster its slippety-sliding sales and struggling image. It’ll open most of its 1,000 stores on Turkey Day, the same as Macy’s, and will stay open for 25 hours straight until 9 p.m. closing the next day, reports the Associated Press. Last Year Penney’s didn’t open until 6 a.m. on Friday, and those precious hours it lost caused sales to slump right out of the gate in the holiday race. It’s not all sigh-worthy news however — the company is also bringing back its traditional snow glob giveaway, something it passed on last year during the reign of CEO Ron “Let’s Get Crazy” Johnson: The retailer will hand out almost 2 million of the holiday globes starting at 4 a.m. on Friday. Next Was McDonald’s Worker Who Served Up Raw Burger Targeting Cop Or Just Incompetent? Next Up: Was McDonald’s Worker Who Served Up Raw Burger Targeting Cop Or Just Incompetent?